The Duchess of Cambridge, Kate Middleton, looked exceptionally pretty in a black and lace dress during an event at the Buckingham Palace. 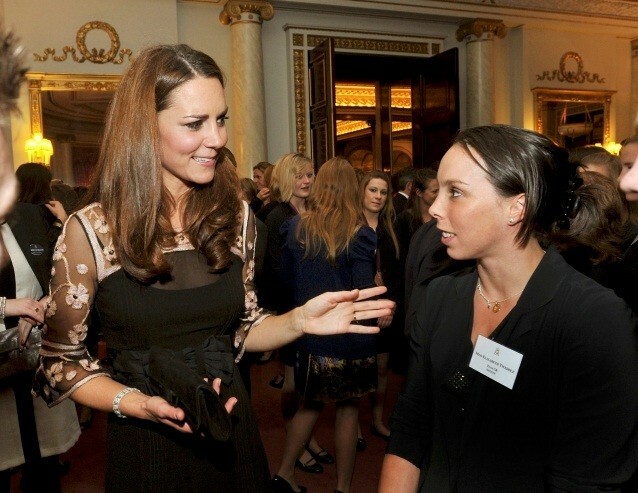 The Duchess of Cambridge mingled with the Olympic and Paralympic athletes during a "thank you" reception at the Buckingham Palace. The party was held because the Queen wanted to salute the British Team for their success at the 2012 Olympics and Paralympic. The athletes earned the privilege to take a trip at the Buckingham Palace as well as to talk and mingle with politicians and royalties. As expected, Kate was dressed to impressed with a black floral Alice Temperley Esmeralda dress and matched it with black suede Jimmy Choo high heels. The Duchess roamed around to meet guests who were also in their official formal wear. Kate was joined along by Princess Anne and her daughter, Zara Phillips, who was an Olympic equestrian. The show was opened by Queen Elizabeth and Prince Philip who welcomed Prime Minister David Cameron as well as other dignitaries. "It was an amazing summer and I think people will cherish those memories, you know, almost more than the 1966 World Cup," said Cameron in his speech. The Duke and Duchess of Cambridge as well as Prince harry certainly were major players during the 2012 Olympics in London. They were highly supportive of Team GB and were seen in almost all sporting events. Meanwhile, it looks like the Duchess of Cambridge has completely set aside her photo scandal. Since she was back in the UK from their South East Asian Tour, the Duke and Duchess of Cambridge already made attendance in several sports related occasions.